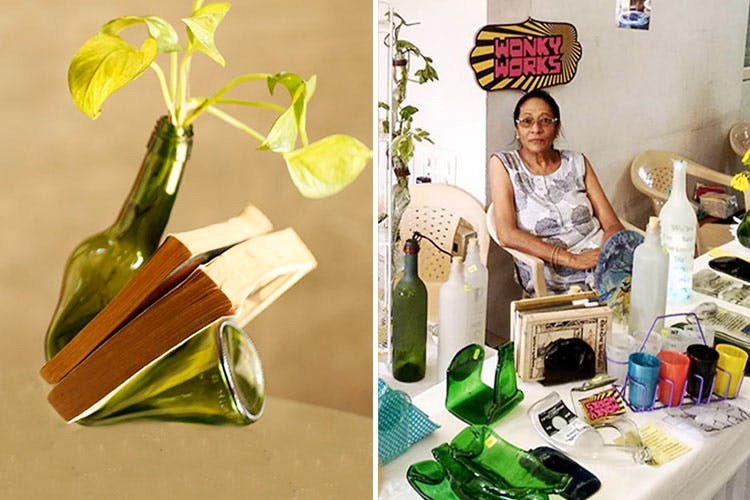 Wonky Works is a Vadodara-based glass design studio that upcycles glass into cool art, furniture and even pendants. The first-of-its-kind in India, this one is all for sustainability and green design. Like something? They ship across the country. Ekta, the glass mason and the brand’s founder has decidedly chosen to work with a bunch of women colleagues. Everything from the furnace to packaging and shipping is handled by these worker bees who artfully turn discarded glass into utility products. Their range of products has grown from being just all sorts of distorted, tipsy vases to quirky tableware and desk accessories. There are also mini plants stuffed inside necklaces or perfume bottles with tiny notes. It may be unusual but hey, it’s cool, it’s sustainable and oh so adorable. Wondering how they get all this glass to upcycle? Well, used bottles of oil, vinegar and more from homes, discarded medicine bottles, local folks looking to dispose off beer and wine bottles or even neighbourhood scrap dealers willing to sell off glass rejects… Wonky Works sources its glass supplies from every possible avenue. In fact, even you can courier spare bottles to Ekta’s workspace, she can create something for you and go as far as to personalise it with an etched impression of your name, initials, a quote or anything at all. The jewellery is a bit on the expensive side.